I get asked A LOT about how we organize our camper when we hit the road for awhile. Clutter has always been my nemesis on long trips, so I’ve tried my best to make sure we have a system that is neat and convenient. We have to organize food, bedding, toiletries, shower stuff… Yes, shower stuff. When you are on the road for a few weeks in a pop up camper, you are going to have to learn to navigate the public showers. 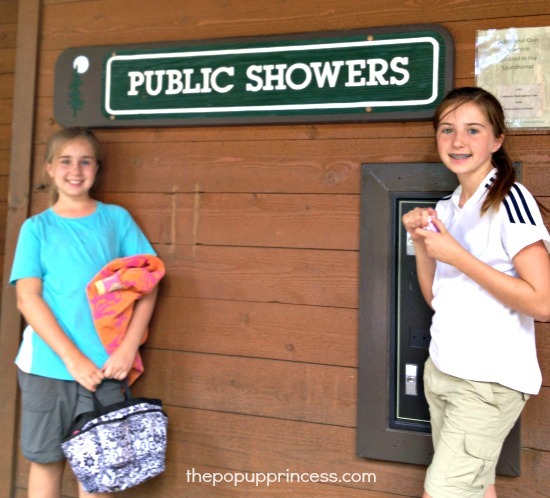 Our first trip, I was terrified to take my kids to a campground shower, but I soon realized they really aren’t that bad. In fact, most big campgrounds have very nice facilities, and as long as you come prepared, they aren’t a big deal. Each bag contains a towel, flip flops, and a shower lanyard. We also try to keep a Ziploc baggie of quarters in there, too. They are all stored in the trailer now, but we used to have a Rubbermaid tote that held all the shower bags and towels. Whenever we head to the showers, we change into flip flops, grab our bags, and carry our towels. The bag is big enough to hold a dry change of clothes and our lanyards. We always wear flip flops in the showers. I know lots of campers head to the showers in Crocs, but I feel like flip flops protect our feet, but still allow us to wash them, so that’s what we use. My favorite part of the system, though, is our shower lanyards. In the beginning, we just had color coded travel bottles, but the idea of setting our supplies on the shower floor gave me the creeps. We also had a few bottles that got left behind, and I knew I had to come up with a different solution, so I made these. Each person has his own shampoo, conditioner, and body wash, and the shower lanyards keep everything off the floor and in one place. We can loop them over the shower head or curtain rod while showering, and everything is conveniently within reach. The body loofahs unclip easily when we need to use them, then clip back on for storage. There is also Velcro at the top of the lanyard, so we can loop them over our new towel racks to dry out in between showers. Whenever we head off to the bathhouse, we get so many comments on our lanyards that I thought I would share how I made them with you. They are super easy and relatively inexpensive, but absolutely indispensable. First I transferred the hand sanitizer to another bottle and washed the small clip bottles out thoroughly. You can use an adhesive remover to remove the existing labels. Then add your own vinyl labels or stickers to mark which bottle is which, or you can simply write on them with a permanent marker. 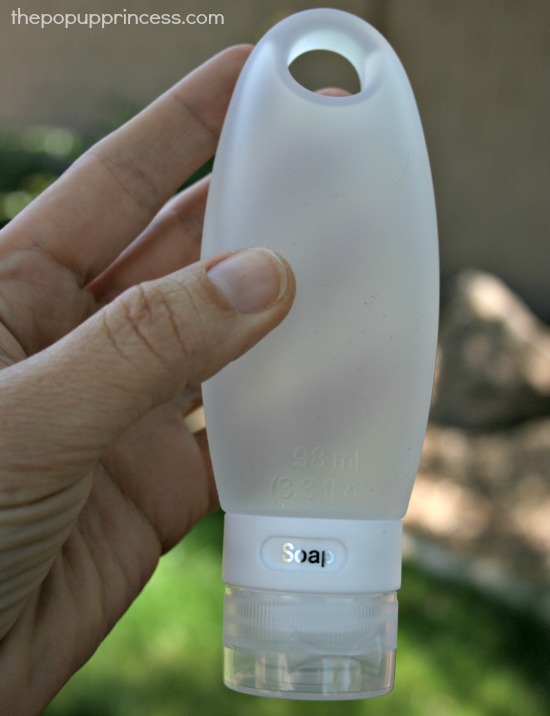 Alternatively, you can use silicone bottles like these. I recently switched ours out, and I love them. They are a bit larger, so I don’t have to refill them as often. They are also easier for little hands to squeeze, have a built-in labeling system, and are color coded, so they are much more convenient… although they are a bit on the expensive side. Then you’ll want to cut your webbing to the length that you want. I made the girls’ lanyards a little longer because they are the shortest members of the family. I used the entire yard for them because I wanted them to be able to easily reach their toiletries when the lanyards were hung over a shower head. Then heat seal the ends of the webbing with a lighter to keep them from fraying. Next, you’ll thread your swivel clip through the webbing and make sure both sides are of equal length. Stitch about 1″ up from the swivel hook to secure it. You will want to stitch back and forth over this several times to make sure it is secure. Then thread a d-ring onto the webbing, measure up 1″ and stitch again. Continue with this process until you have the desired number of d-rings attached. I also alternated the direction of the d-rings so that all the toiletry bottles wouldn’t be clumped together on one side of the lanyard. 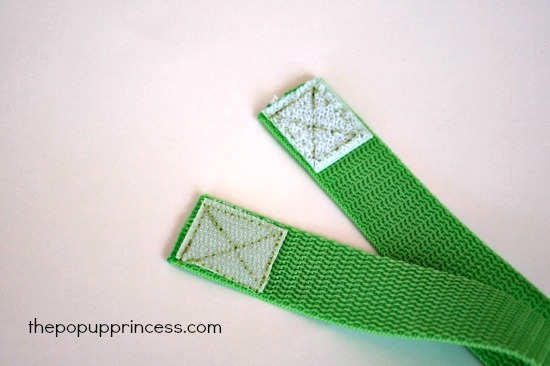 Then you sew hook and loop Velcro to the ends of your webbing. I sewed one piece to the inside of the webbing and one to the outside. That way it makes a nice loop, and I don’t have the ends sticking up funny. You could totally skip the Velcro and simply sew the ends together, but I really have found the hook and loop closure to be handy. That’s all there is to it. You can clip on your toiletry bottles and body loofah, and you are set! You’ve got an easy way to keep all your shower essentials together and within reach. Because the bottles are small, they empty pretty quickly–that’s why I prefer the iNeibo silicone bottles. If we are on a long trip, I have to refill them less frequently. I bring along bigger bottles of shampoo, conditioner, and body wash to refill our lanyards periodically while we are traveling, which is a bit of a pain, but I’ll take it. These little lanyards make shower time at the campground a breeze. So that’s the system that works out best for us. I’m sure there are some other fabulous ways to keep all your shower stuff organized, so feel free to comment below. If you’ve got a way that works best for your family, I’d love to hear it! Once again I am amazed at your ingenuity Larissa! We are going to make some shower lanyards too. Thanks for the idea. What do you do to corral all of the shoes when camping? I am going to try an idea I saw on Oz and Us’s website. They hang a plastic shoe bag from the side of the pup. Thanks, Sonya. You’ll love the lanyards. They are awesome! We bought a mesh pop up hamper on Amazon when we were tent camping. It happened to come with a smaller low profile hamper, too. The taller hamper goes in the PUP for dirty clothes, and the shorter hamper goes on the “porch” to hold shoes. We sometimes bring it in for the night if it seems especially wet or we are worried about wildlife. It works pretty well, but I’m still on the lookout for something better. That is just awesome! So glad for the tutorial! My husband is not a fan of the loofah, so I found a small mesh bag from a gift set and I just drop a bar of soap into it. 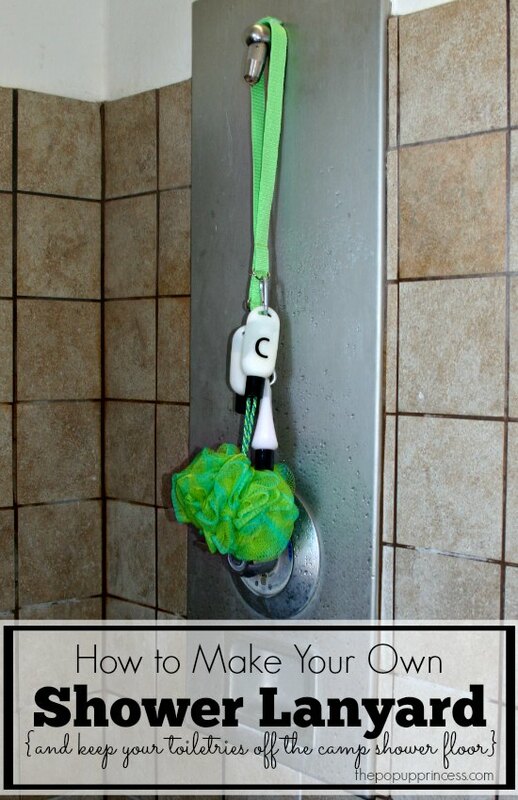 It works like a loofah and the soap stays in the bag. Ingenious idea! I can’t use scented body wash, so thank you for the idea! I love this idea. We are going camping in a few weeks and I will definitely be using this idea for our trip. Thanks for all the great ideas..
update–I found my *bottles* at Walmart during the school supplies spree–germ-x bottles with a carabiner clip for $.97 each. I filled up a larger bottle from the germ-x bottles, rinsed them out with soap and water then attached them to a lanyard…we have plenty of them around the house. Good to know, Sherri! I’ll have to check that out! We got cheap bags from vistaprint (thanks to a coupon) kids were able to pick a photo or clip art they liked. We did not put names on them for safety They lay nice and flat! Will be simple and easy store. Thank You , so much Larissa. We just brought a Pop-Up after tent camping for 7 years, we got tired of being rained on. You have inspired me to redecorate the Roam a Home, and get it neat and tidy. Where did you purchase the nylon webbing? My local craft store appears to sell it only online and in one color – black. At least that’s what their website says. Hobby Lobby…I forget about that store. And I never would have thought to check Walmart. I guess I need to step out of my bubble. 🙂 Thanks! I recently found Pantene conditioner travel size bottles at Big Lots for a quarter each. I bought several just for this purpose! 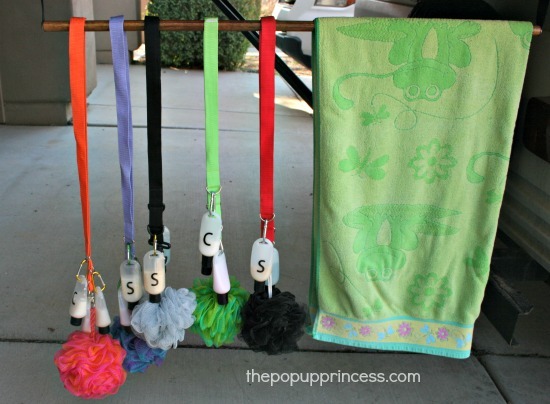 As I use one, I rinse it out, and will fill them for our shower lanyards! I also love the steripods. 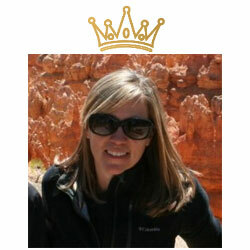 I just found your blog thru Pinterest, and am excited to see so many of my “plans” already being used successfully. We tent camped for over 20 years before buying our pop up last year. So excited to read more of your blog to find more ideas. i too had trouble finding the bottles. they used to have the hand sanitizer at dollar tree, but i went there yesterday and i could only find one. i went back on here earlier today and someone suggested big lots. well, i just got home and they had 3 huge containers of 25 cent hair conditioner with the loop on them. needless to say , i bought a bunch of them. i love this website!!! Nice find, Linda! I’ll remember that! Mairi, do you have disposable travel sized bottles in the UK? I was able to find a small travel sized bottle of Pantene shampoo in a Target store, which made good replacement. I know that Amazon sells ShowerLine replacement bottles, which are also a good option. Not sure how Amazon works in the UK, though… Let me know what you find out. My question is directed towards your shower bag. I’ve been looking for years and have tried several options but haven’t found “the” one. 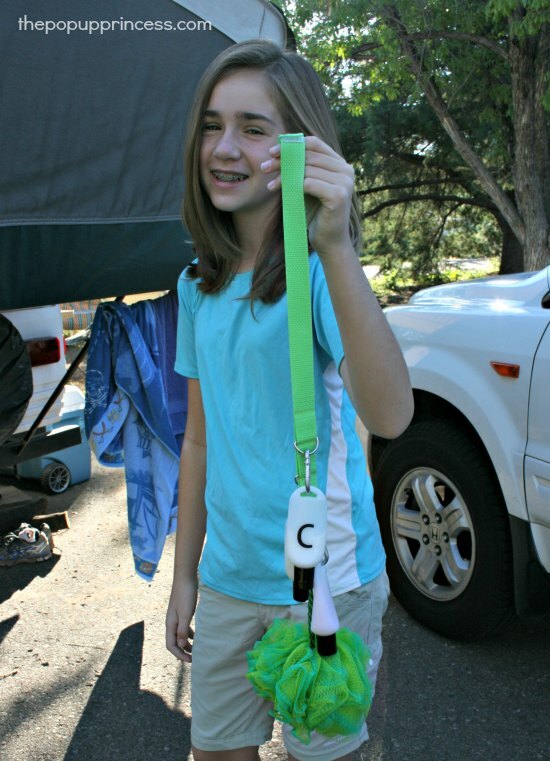 I looked at diaper bags, lunch boxes, thirty-one products and dorm room shower caddys… Want two short handles, outside pockets, holds its shape when put down and washable. The one you have pictured seems to fit most of my wants. Does that bag have a brand inside or do you now where it was purchased? I love your lanyards. 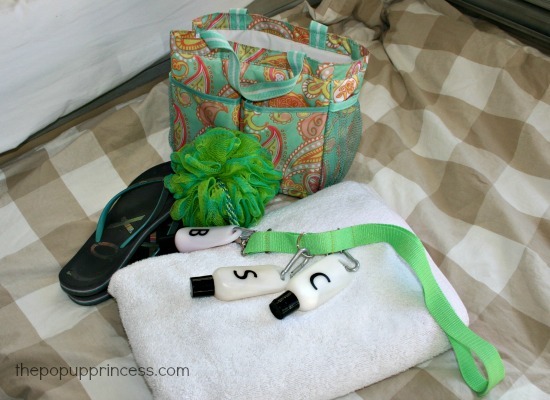 When we travel (camping or hotel) we each have a bathroom bag. It holds soap, shampoo, conditioner, toothbrush/paste, deodorant and loofah. Each one is a different color so no one takes the wrong one. So far it has worked pretty well for us. My older son uses his at college in the dorm showers! Keep the great ideas coming! I’m sooo anxious I just ran out at lunch and got the webbing & hardware to make 4 of these this weekend!! I don’t sew. Do you think I can make these with hot glue? Or do you think the weight of the bottles will eventually pull it apart? Amazing amazing amazing!!!! Thank you for this wonderful site! 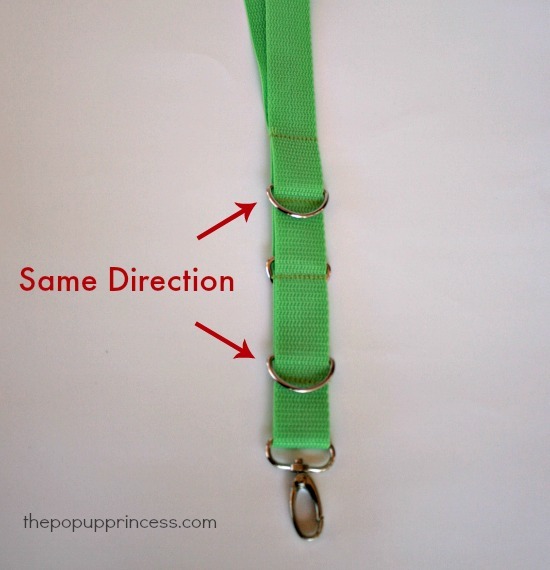 We are in the process of looking for a PUP and your blog is so helpful. 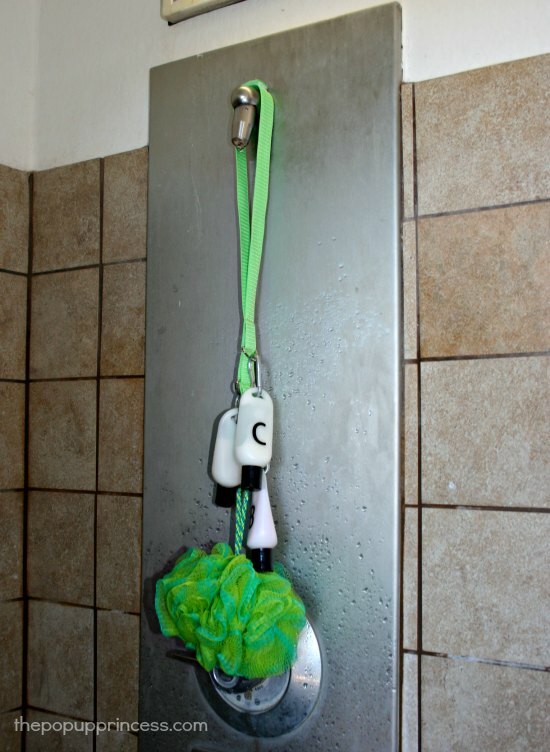 Great way to carry your shower products. 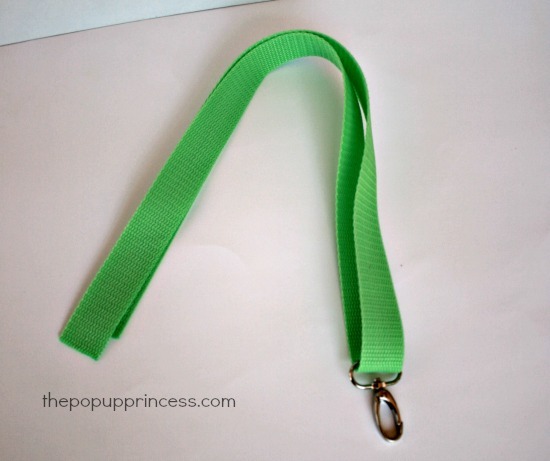 If you aren’t handy with sewing, we sell a Shower Lanyard on Amazon.com. If you want to make one and you’re having a hard time finding the bottles, we also sell them in 3 packs without the lanyard. I looked for ages to find the bottles without paying a fortune. I finally ran across them at Office Max. They had small bottles of hand sanitizer on sale for 50 cents. Sturdy bottles with carabiner attached! Larissa. Love this idea!!! I was wondering…. What did you use to clip the the shampoo tubes to the D-rings? And what is the swivel clip for? Thank you. I am making these for our family. I have tried big 5 gal buckets (one for girls and one for the boys) but they were too cumbersome. Then we had small hard sided one handled baskets but those didn’t have any divisions. Now that my kids are older and showering on their own, this lanyard style will be very helpful so they don’t forget things in the shower. This will also come in handy for when they are at resident camp without me. I also love your idea of the shower totes with pockets. I love all the organization they provide. Thanks for the tips! I made the shower lanyards and I wanted to share the picture with you but don’t know how. I *think* they cost me around $6 each to make. It’s been awhile, Kathleen, so I don’t remember for sure. I do remember than when I was looking at the cost of making the lanyards compared to the ShowerLine caddy, it was cheaper to make the lanyards. That included the bottles, but that was when I was using the $1 hand sanitizer bottles from DollarTree. I am in the process of making one of these, thanks so much for the info. I also wanted to share how i made a microfiber towel using dollar tree wash cloths. I bought 4 packs of three washcloths and sewed them together to make a large, lightweight, very absorbent, fast drying bath towel and added a loop to hang on the shower hook. I looked at microfiber bath towels online and they were way more than $4.00 ! You can get large micro fiber towels on ebay for $4 and under. Love this idea and am seriously considering making them for this summer’s camping adventures. When looking at materials it looks like at least on Amazon the swivel clips come in big quantities. Is there any reason to use the D rings for the bottles (and need clips too) or would it work just as well to use all swivel clips so then the clip for the bottles is already built it?? I plan on getting some nicer silicon bottles so they’re a little bigger and easier for my small kids to use anyway. I made this and love it! I added an extra spot for my razor to hang from. I just used a ponytail holder and wrapped it around the top of my razor . Nice way to keep all shower items together. I dont camp but I do travel and its nice to keep all items off the hotel bathtub and makes it easier to dry them out too! I am looking at making these for my family for an upcoming camping trip and I was wondering what type of thread you used to sew your webbing. Thanks! A lot of people might look at this and think, “Really? All that just for shower supplies?” But it’s small things like personalized shower supplies that not only make a camping trip easier, but even more fun than it already is, especially for the kids. I love it!